In Ruth Strong's 60 years of owning and operating a circus, her favorite attraction sat in the stands, wearing dazzled expressions and munching savory snacks. "My mom's love for children was what started the show," said Ruth's daughter, Linda Strong of Ojai. On May 23, Ruth's children and her caregiver brought the 90-year-old Oxnard resident back to the big top. 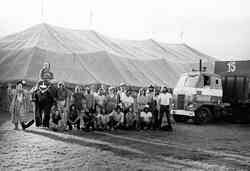 Circus Vargas, set up at the Ventura County Fairgrounds, was empty when Ruth's son, John, wheeled her to a ringside box seat that day. Ruth sat calmly, neatly dressed in an outfit that included a cream sweater, pearls and red carnation corsage, as families trickled into the darkened tent. John and Linda, both 48, explained that their mother suffered two massive strokes six years ago and had just in the past month begun remembering her past. The children were quick to fill in family history, although Ruth spoke with poise and lucidity of her own circus days. 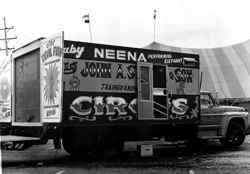 Her late husband, "Big John" Strong, who died in 1992, had started their circus in Hollywood in 1948 with his then-new wife. 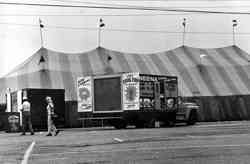 "He always wanted to have a circus," Ruth said. "It was, I think, in his blood." "There are so many stories," said Ruth's caregiver, Karen Overzat, who decided to take Ruth to the circus that recent day. A wannabe actor, 6-foot-5-inch Big John took easily to the ring, donning tails and a top hat that made him appear even taller. Ruth was comfortable in the spotlight, too. "In school, I always had the lead in every play," she said. Still, the newlyweds had to start from scratch. "It started with one dog and one pony," Ruth's son John said. Ruth trained the animals, and the couple took their little show on the road. The couple's acts and animals grew in number and variety until their circus needed more land. In 1954, they bought a few acres in Thousand Oaks, next to what is now the Civic Arts Plaza. At their "winter quarters," elephants grazed under oak trees and Ruth continued to train about 50 animals. "It was love and discipline in equal measure," said Linda, who began riding elephants at age 4. 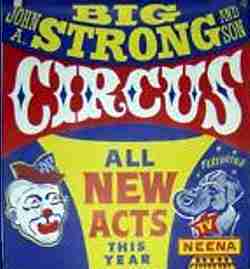 Within 15 years, the Big John Strong and Son Circus was one of the biggest three-ring tented shows around, John said. "You don't know how many people love circuses," Ruth said. 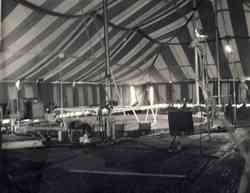 From May to October, the traveling circus set up in a new town each day. The whole family performed, including John and his two adopted sisters, Linda and Sandra. The children attended Ventura County schools off-season; all three graduated from Newbury Park High School. "We made sure they got a good education," Ruth said. 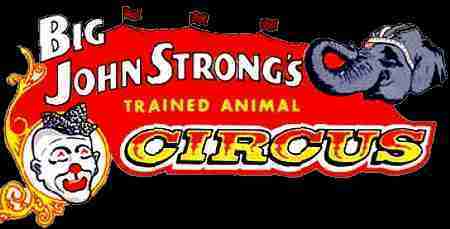 Today, John runs the John Strong Circus, which has morphed into a traveling walk-through oddity show with 150 exhibits. Ruth never questioned involving her children in circus life. "It was a healthy life," she said. "Traveling was good for them and meeting different people was very good for them. "I liked meeting people," she added. "I especially liked the kids. I love children. I guess that's why I loved the life I lived." Ruth's plan for many children of her own was short-circuited when her first husband, an officer in the U.S. Army Air Corps, was killed at age 25 in a car accident. The couple's infant son died just two weeks later. "She lost her whole family within two weeks of that accident," John said. "(But) she never gave up." To take her mind off the grief, Ruth, then 25, volunteered to help in a Hollywood hospital during the polio epidemic. At 28, she met Big John Strong in Hollywood. They dated and then married. When they tried to start a family, Ruth had one miscarriage after another. This Wednesday evening in May, the painful memories move across her eyes like shadows on water. Then, as swiftly, poems tumble out of her mouth. "Love is the key to all things, it opens the door to beggars and kings," she began, "changes the destiny of every life and lessens the frustration of daily strife." Ruth recited two long poems words she wrote after her first husband died about loving in the face of adversity and faith in a grand plan. Indeed, after Big John Strong died, Ruth remarried yet again. "I believe in a higher power," she said. "It's like it is in my poems." Her children know her poems by heart, too. "Just because you have tragedy in your life we all do," John said. "Sometimes you can be just inches from total success." He looked at his mother, sitting in front of him. "She once told me if you live each day to its fullest, you'll live a long life if you live to 28," he said. "Love is what's important in life. You see the love in the kids' faces at the circus here. It's love and joy the family can share."